Keys Buttons durability (Left / Right): 10 million clicks. 6 buttons to simplify in-game actions. Button Mechanical Button Tensioning System. 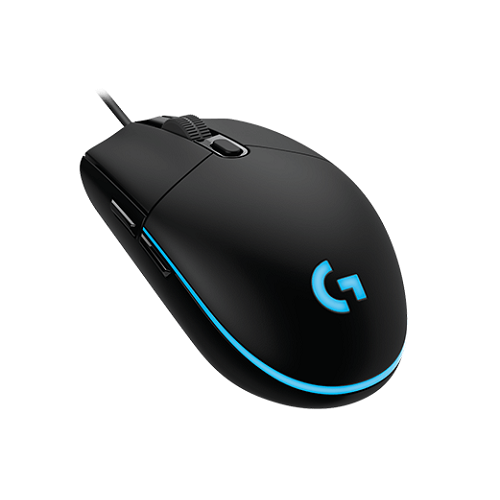 Logitech G102 PRODIGY Gaming Mouse reports 1,000 times per second, 8x faster than standard mice. This means when the mouse is moved or clicked the onscreen response is virtually instantaneous. Play to your full potential with a mouse that offers 200 to 8,000 DPI delivering incredible accuracy, tracking speed and consistency. LIGHTSYNC technology provides next-gen RGB lighting that synchronizes lighting and game profiles with your content. Customize from a full spectrum of approximately 16.8 million colors and synchronize lighting animations and effects with your other Logitech G devices. Customize it all quickly and easily using Logitech Gaming Software (LGS).On-the-fly DPI shifting between two sensitivity settings with a click, from pixel-precise 250 DPI targeting to speedy 2,500 DPI movement. Use LGS to customize the DPI settings to fit your style of play. Also, DPI cycling lets you choose from up to five DPI settings while in-game.System requirements are Windows® 7 or later, macOS® 10.11 or later, chrome OSTM, USB port and internet access for Logitech Gaming Software (optional).Responsiveness data formats are 16 bits/axis, USB report rate: 1000 Hz (1ms), microprocessor 32-bit ARM.